Remy David, former authorized MCI's service technician in Fort Lauderdale. Producer/engineer. I remember seeing this behemoth when they brought it to the AES. I was also living three blocks away from the factory in Fort Lauderdale at the time. I worked at an international advertising agency with a studio and equipment I specified. So I also took all of the MCI technical training seminars to become an authorized service technician. It should be interesting to note, this machine was never released. 3 inch tape they could not keep from skewing on the heads. It would work vertically but not horizontally according to the laws of physics. The transport deck plate was the most fabulous deck plate for a recorder they had ever made. It was a solid diecast peace. It was extremely rigid unlike any of their other machines with a simple aluminum plate. It was really pretty funny at the AES. I had known about the machine but hadn't seen it. So I went to open up the electronics Door to look at the Electronics just as they told me not to but it was too late. There weren't any electronics in it. LOL they were embarrassed by that. It was simply a transport on display. 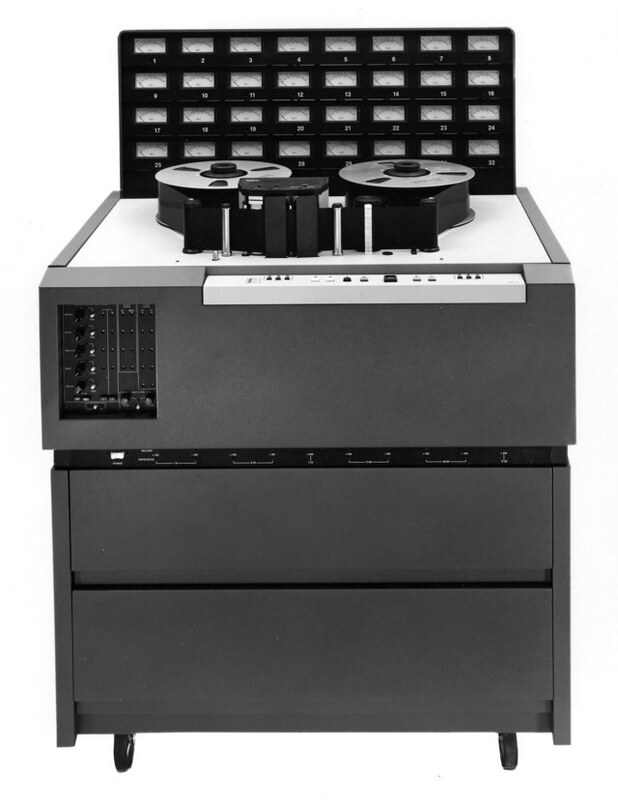 I told them I had the fix for the 3 inch tape path problem. They told me according to physics, it won't work in the horizontal position. 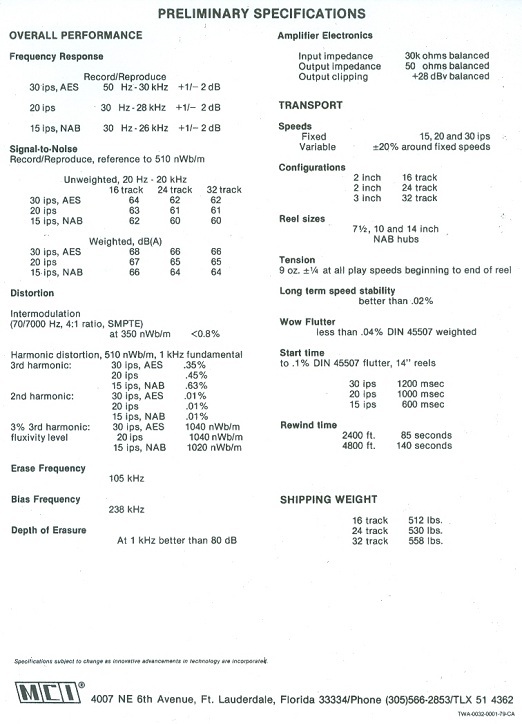 They didn't realize that a simple vacuum operated tape guide system would solve the problem. I had been utilizing 2 inch video recorders that utilized vacuum tape guides. It was the logical answer to a physical dilemma of physics. Unfortunately, they had already canned the 3 inch 32 track project. I wanted to buy the transport. It would've made one of the best 2 inch transports manufactured in the USA but they wouldn't sell it to me. It's nice to see its shiny smiling face here again. Photos courtesy of Larry Lamoray and Carla Harned, of MCI. 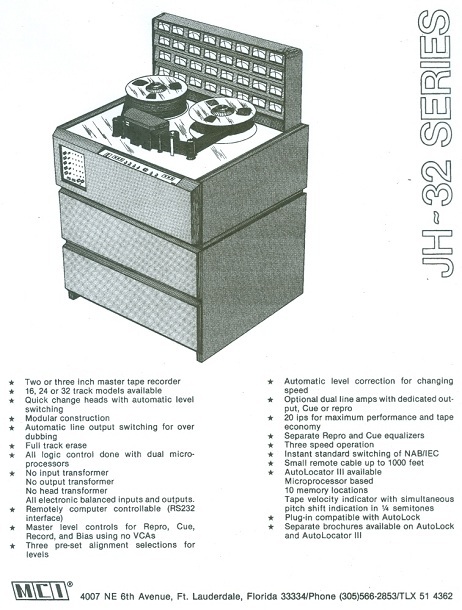 Do you have content, to add, about the MCI JH-32 Series 3" / 32 Track Machine or associated topics? Please feel free to Share it, here!